Customized squirrel shape bottle opener animal keychain is a whimsical item, which appeals to customers of all sizes and interests. This animal keychain is perfect for promoting nuts, wildlife, nature, pet owner clubs, pet stores, veterinary clinics, art & craft supplies, summer camps, youth clubs and many more. It easily offers thousands of brand impressions at any time due to its unique design and manageability. People are not ready to part with it easily and they always retain it as a bottle opener, key holder and amusement token. 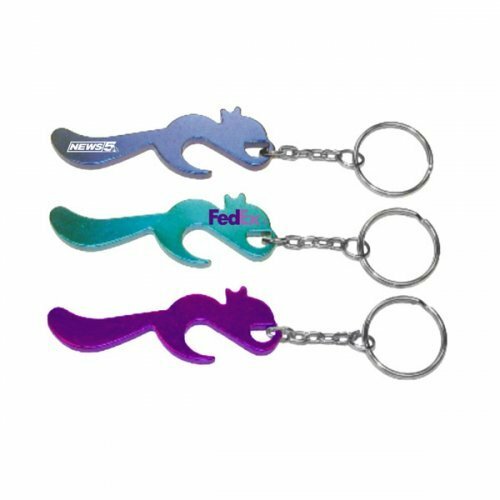 Request a quote to know price savings on wholesale promotional squirrel shape bottle opener keychain. Features – Squirrel shape bottle opener in aluminum with metallic color finish. Product Size – 2 5/8" x 7/8"
Available Colors - Metallic Blue, Metallic Purple and Metallic Green. Imprint area – 3/4" x 1/8". Imprint Area : 3/4" x 1/8"
Product Size :2 5/8" x 7/8"